Investing thousands of dollars in a video surveillance system only to find out something failed in recording the video won’t happen with the ReportStar Assurance Plan. This proactive plan ensures that your video surveillance system is working when you need it most. To login to your ReportStar customer portal please click here. Please contact us to learn more about how ReportStar Assurance Plan can help you manage your video surveillance system. WHAT IS THE REPORTSTAR ASSURANCE PLAN? 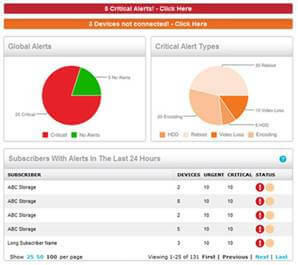 Configure ReportStar to alert you to recording problems. 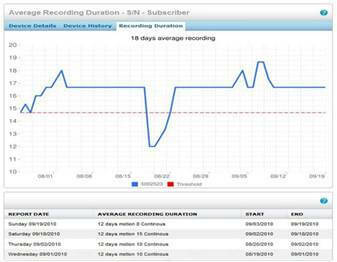 Obtain easy to understand visual tools to quickly verify a recorders health. This tool gives you a visual representation of the recorders retention capabilities as well as allowing you to set a recording duration threshold and be notified if this threshold is not being met. This tool allows you to know not only if a camera is recording; it tells you if it is recording what it was intended to record. It also tells you if infrared (IR) illuminators are functioning correctly. 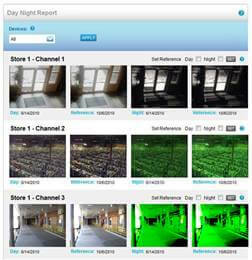 View day/night image reports and visually verify that a camera is capturing the correct areas to be monitored.